The preceding chapters of this publication are concerned with the operating and design principles of automatic weapons which employ a reciprocating bolt and derive the energy required for full automatic operation from blowback, long recoil, short recoil, or gas sources. There is another class of weapon, known as the revolver cannon, which is sufficiently different from the weapons described up to this point to merit individual and carcful consideration. 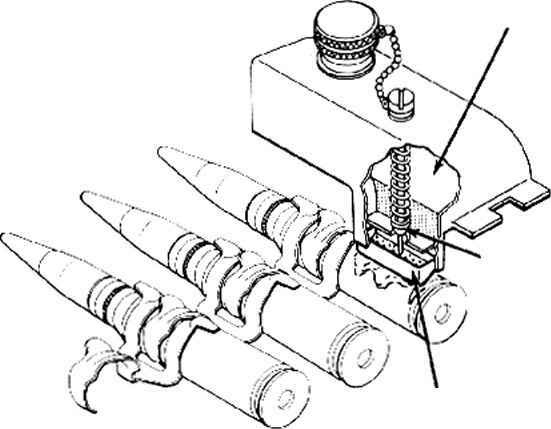 The principal difference between the revolver cannon and the reciprocating cannon does not lie in the source of operating energy because all machine guns of the full automatic type described in this publication use a portion of the energy released by the explosion of the propellant charge of each round to clear the weapon and to load and fire the next round in such a manner as to producc sustained or repetitive fire. Furthermore, the difference does not occur in the system whereby the energy is derived and applied since revolver cannons of the full automatic type obtain the power for their operation from recoil, gas, or even residual pressure in accordance with the same principles which arc applicable to guns having a reciprocating bolt type of action. The real difference between the reciprocating cannon and the revolver cannon lies in the arrangement of the mechanical functions constituting the automatic cycle of operation and in the mechanisms associated with these functions. Thus it appears that the classification of machine guns into the two groups, reciprocating weapons and rotary action weapons, represents a different type of classification than has been used in the preceding chapters of this publication. In these chapters, primary attention is given to the systems by means of which energy is derived from the explosive pressures developed in the combustion of the propellant charge and is applied to produce the mechanical motions necessary for sustained automatic fire. In treating each of these systems (blowback, long rccoil, short recoil, and gas), the basic mechanical functions used to illustrate the application of the operating energy arc the functions associated with reciprocating type actions. Actually, since these same systems are applied in a very similar manner to the actuation of rotary action weapons, it would have been entirely possible to cover the application of the recoil, gas, and blowback systems to rotary action mechanisms at the same time that their application to reciprocating mechanisms was described. However, the problems arising in the design of rotary action weapons are so special that it is practically mandatory to consider them separately.